Imagine for a moment a reality where all the technologies that futurists have predicted have already been invented and are currently being used by a privileged few. 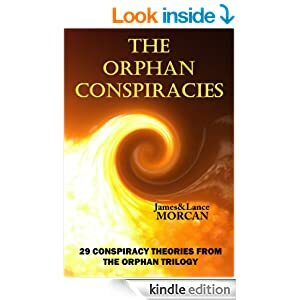 We devote an entire chapter and more to this topic in our new release book THE ORPHAN CONSPIRACIES: 29 Conspiracy Theories from The Orphan Trilogy. Our exhaustive research revealed that most secret technologies are rumored to be based on the works of the brilliant Croatian-born Serbian-American scientist Nikola Tesla (1856-1943). An inventor, physicist and electrical engineer, he (Tesla) is surely history’s most underrated scientist. In fact, when researching suppressed science, it often seems as if all roads lead back to the man who was nicknamed the Electric Magician. To attempt to verify the Splinter Civilization’s existence and ultimately understand its nature, we all must first comprehend what Tesla achieved in his eventful lifetime, including his tragic last few years. 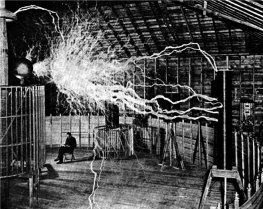 Nikola Tesla…aka the Electric Magician. In terms of official science, he is probably best known for designing the modern alternating current (AC) electricity supply system as well as his theoretical work used in the invention of radio communication. He’s also referred to by many as the godfather of wireless technology, having first demonstrated wireless energy transmission in 1891. After migrating to the US, Tesla worked for light bulb inventor Thomas Edison and fellow inventor George Westinghouse before branching out on his own. He began conducting more radical experiments involving remote-controlled devices, artificial lightning and thunder, early X-Ray testing, robotics, electric cars and lasers, and he even investigated whether it was possible to collect vast amounts of energy from the earth’s atmosphere. As revolutionary as Tesla’s known inventions and experiments sound, it’s his long-rumored suppressed inventions that have spawned countless conspiracy theories. Claims surrounding him include everything from perfecting free-energy technologies to being responsible for the mysterious 1908 Tunguska explosion in Siberia. Tesla’s high-frequency power experiments are also said to be the scientific foundations of HAARP, a controversial military-funded research program. (Read more on HAARP later in this chapter). During his later years, between the First and Second World Wars, Tesla worked on a directed-energy weapon (DEW) he called a teleforce gun. 21st Century researchers now refer to this device as the Tesla Death Ray. Many believe it was stolen and used by the military; and many believe it remains in use today – possibly in a more advanced form. As per one of his theses currently stored in the Nikola Tesla Museum, in Belgrade, Serbia, the inventor described his DEW device as being a “superweapon that would put an end to all war.” He also said it could stop fleets of airplanes and entire armies dead in their tracks. Tesla claimed he was spied on by the US War Department as well as agencies of the Soviet Union and various European nations as a result of this fantastical invention. Decades later, Tesla’s Death Ray and other works were referenced in a weapon patent taken out by Columbia Universty and MIT-educated physicist Dr. Bernard Eastlund. As much of Tesla’s material is no longer available to the public, it’s impossible to prove or disprove his most radical science. Certainly his overall career is barely studied at learning institutions today and he is not held in the same high regard as scientists like Newton or Einstein. This despite Tesla obtaining approximately 300 patents worldwide for his inventions of such diverse things as alternating current generators, fluorescent lights, exotic power systems and even flying machines. Whatever the case, there’s enough evidence to conclude Tesla was hounded by the energy power brokers – Edison and American financier J.P. Morgan in particular – of the late 19th and early 20th Centuries. These figures recognized Tesla’s technologies as a serious threat to their financial empires and, in Edison’s case, to his scientific legacy as well. When Tesla died in 1943, the US Government confiscated all his research material and immediately classified much of it. However, in recent years, through the Freedom of Information Act, some of that research has been declassified, leading to a resurgence of interest in Tesla. Various independent investigators and freelance scientists claim they can identify irrefutable connections between Tesla’s inventions and the most advanced technologies used by the military today. “As an eminent pioneer in the realm of high frequency currents… I congratulate you on the great successes of your life’s work.” –Albert Einstein, in a letter to Tesla for his 75th birthday in 1931. In January 2014, it was reported by The New York Times and other mainstream media outlets that America’s National Security Agency (NSA) uses secret technology to remotely input and alter data on computers worldwide – even when targeted PC’s or laptops are not connected to the Internet. This suppressed technology, which uses radio frequencies to spy on computers, only came to the public’s attention due to leaked NSA documents from former agency contractor-turned whistleblower Edward Snowden. And what if most of the technologies readers and cinemagoers are presented with in bestselling books and blockbuster movies are not science fiction, but science fact? What if they currently exist on the planet, but are suppressed from the masses? Were a documentary film ever to be produced based on the conspiratorial history of suppressed technologies, the individuals featured would include everyone from inventors who either suddenly died, went missing or faded into obscurity, to tech investors who were mysteriously thwarted to scientists who lost their patents without receiving any valid explanation. If such technologies do exist, that would likely confirm there is a Splinter Civilization that secretly and autonomously resides on our planet right now. Such a group’s membership would probably be a combination of high-ranking military personnel, senior intelligence agents as well as shadowy government figures and many of the global elite already named or alluded to in previous chapters. Although all citizens of various nations and speaking different languages, they would be united by the common goal of attaining mass power, or a New World Order. Is the New World Order already here? Sounds like a theory we should reserve for one of our future movies or novels? You’d be right, except for one important point. Many of these suppressed technologies have been reported by former engineers and other employees of the Military Industrial Complex. And the list of whistleblowers is an extensive and impressive one that dates back decades. Based on the reports of those same whistleblowers, it appears suppression of scientific technologies is done for various reasons. Sometimes it’s about governments wanting to achieve or maintain superior military might. Other times it’s for financial reasons. Few would deny it’s in the interests of corporations that financially benefit from current technologies to block newer, more advanced technologies ever reaching the marketplace. Though immoral, that would make good business sense as it’s an unwritten rule that corporations squash competitors and quash competition. In the course of writing The Orphan Trilogy, we researched numerous scientific inventions rumored to exist somewhere in the world right now. Covering the entire history of suppressed science would require a whole book rather than this single chapter. Therefore, we will focus only on several rumored technologies, albeit ones that potentially hold great significance for humanity. Most secret technologies are rumored to be based on the works of the brilliant Croatian-born Serbian-American scientist Nikola Tesla (1856-1943). An inventor, physicist and electrical engineer, he is surely history’s most underrated scientist. In fact, when researching suppressed science, it often seems as if all roads lead back to the man who was nicknamed the Electric Magician. To attempt to verify the Splinter Civilization’s existence and ultimately understand its nature, we all must first comprehend what Tesla achieved in his eventful lifetime, including his tragic last few years. “As an eminent pioneer in the realm of high frequency currents… I congratulate you on the great successes of your life’s work.” –Albert Einstein, from a letter to Tesla for his 75th birthday in 1931. Free energy ain’t free, baby! As mentioned, there can be numerous reasons for suppressing inventions or discoveries. But financial gain is likely to be top of the heap. And few scientific breakthroughs could bankrupt large corporations like free-energy technologies would. In a nutshell, this conspiracy theory suggests technologies have already been invented to provide for all the world’s energy needs for free. Some of these suppressed inventions are apparently capable of generating their own power seemingly out of nothing. Quantum vacuum zero point energy is one example. Other devices are said to have the ability to extract energy from pre-existing reservoirs in nature. Perpetual energy is a viable technology conspiracy theorists tell us, but unfortunately, it seems, there’s also a perpetual war against it. For as long as energy companies exist, they will never allow such inventions to reach the public. After all, these technologies would decimate the oil, gas, electricity, nuclear and automobile industries overnight. This theory asserts that by propagating the lie that expensive energy systems are the only options available, big corporations are able to control one of the planet’s most lucrative fields. Electrical engineer Thomas Henry Moray (1892-1974) claimed to have developed a working device for extracting free electricity from what he termed radiant energy waves of the atmosphere. He called his invention the Moray Valve and stated it was an effective extractor of an inexhaustible energy source. The scientific establishment immediately dismissed the device as a hoax. However, Moray claimed he received death threats and was even shot at in an effort to prevent his free-energy technology ever seeing the light of day. Dr. Eugene Mallove was an MIT and Harvard-educated scientist, cold fusion advocate and publisher/editor of Infinite Energy magazine. He also founded the New Energy Foundation. Mallove’s 1991 book Fire from Ice: Searching for the Truth Behind the Cold Fusion Furor outlined the science he believe proved the existence of cold fusion, a hypothetical free energy source derived from nuclear reactions. In particular, the book detailed a controversial experiment conducted in the late 1980’s by one of the world’s eminent electrochemists, Martin Fleischmann, and his partner Stanley Pons. Mallove believed the pair had invented an apparatus that successfully replicated cold fusion on several occasions. Fire from Ice asserts that the results of the experiment and the apparatus had been suppressed. As a result, Mallove was ridiculed by mainstream physicists and lost his credibility in scientific circles. In 2004, he was killed at one of his residences in Connecticut. A decade of court proceedings followed in a complex murder trial that finally wrapped up late 2013. The judge ruled his death the result of a botched robbery. Cold fusion devotees however, claimed Mallove’s death was all part of a conspiracy to silence him and bury cold fusion technologies. Interrelated with free-energy are theories that very cheap energy is also possible. Dirt cheap, in fact. For example, there are various conspiracies dating back to the 1920’s surrounding light bulb technology. Some investigators believe that leading corporations suppressed long-lasting light bulbs, forcing customers to regularly replace bulbs. In 1972, Texan bulldozer-driver Richard Clem claimed to have invented a vegetable-oil turbine capable of traveling 115,000 miles on only eight gallons of chip fat. Ford Motors immediately threatened to sue Clem for installing his engine in his Ford Falcon. Richard Clem tops up a car’s engine with Crisco vegetable-oil fuel in 1972. As he attracted more press coverage for his invention, Clem reported he’d received death threats. He refused to yield to pressure and vowed to get his prototype engine out into the world. However, Clem died of a heart attack shortly thereafter. His family believe he was murdered. In the 1990’s, reports began to surface in Japan that an engineer had developed a magnetic motor engine that powered itself. The inventor’s name was Teruo Kawai and he reportedly had his device verified as workable by Hitachi engineers. However, Kawai claims Yakuza gangsters then threatened him and his associates, forcing them to relinquish the technology. This brings us back to Nikola Tesla. As stated earlier in this chapter, many investigators have suggested he invented and perfected radical energy devices that could have provided free-energy to the entire world. These investigators also say the world’s ongoing energy crisis is a total fabrication and that the problem was actually solved a century ago by Tesla. In the early 1900’s, American industrialist J.P. Morgan financed Tesla to construct a tower that would transmit wireless communications across the Atlantic. This experimentinvolved research into the Earth’s ionosphere at a facility called Wardenclyffe, in Shoreham, New York. It entailed using the Wardenclyffe tower to employ naturally occurring frequencies to transmit data like voice messages, images and text. However, the experiments took Tesla in unexpected directions and many researchers believe he discovered and then harnessed a free, universal supply of energy from the ionosphere. 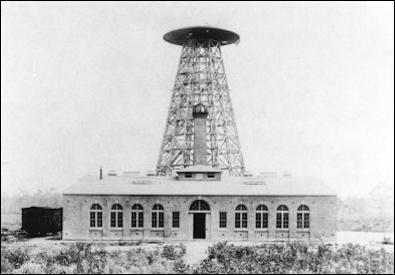 Wardenclyffe tower as it looked in 1902. The inventor had apparently not only found a way to extract electricity, but also to rebroadcast this electricity wirelessly to neighboring towns. Besides being free, he deemed it to be a safe, renewable and clean form of electricity. Tesla’s mission suddenly shifted and he became obsessed with perfecting this newfound free-energy technology. His goal was to get it out to the world to empower individuals everywhere. The Electric Magician expected J.P. Morgan would share his desire to assist Mankind with this incredible scientific discovery. He was grossly mistaken. When J.P. Morgan was informed of Wardenclyffe’s potential to harness an almost limitless amount of energy and freely broadcast it to anyone in the world, he realized it would damage his own electricity empire. As a result, the industrialist instantly terminated all of Tesla’s funding. This effectively shut down the project as Tesla had lost his primary funder. Believe it or not, electric and hybrid technologies for motor vehicles have existed since the early to mid-19th Century. Hungarian engineer and priest Ányos Jedlik has been attributed by many as designing the first electric motor in 1828. Jedlik invented a small model car that was powered by his motor. However, the world’s first recognized electric motorized vehicle, a locomotive that used electromagnets and a battery, was constructed by American inventor Thomas Davenport, in Vermont, in 1835. Around this same period, other inventors built basic electric vehicles and demonstrated them in public all over the world. By the 1880’s, the first practical electric cars were invented. European governments, including those of France and the UK, agreed to provide support and infrastructure to the electric car market. This enabled early automobile manufacturers to mass produce such vehicles.Soon, electric cars were being driven by consumers Europe-wide. By the 1890’s, electric vehicles hit the US market and proved to be very popular with American motor enthusiasts. In New York City, in 1897, a fleet of electric, battery-powered taxi cabs took New Yorkers around the city’s streets. The cabs were nicknamed hummingbirds because of the eerie humming sound they made. In 1899, a Belgian-built, futuristic, rocket-shaped electric racing car called La Jamais Contente set a world record for land speed, traveling at 66 miles per hour. The vehicle remains on display at an automobile museum in Compiègne, France. Ferdinand Porsche’s electric car…launched in 1900. By the early 20th Century, electric cars were becoming even more popular than gasoline-powered cars. For example, of all the automobiles in New York, Boston and Chicago in 1900, one third of them were fully electric while less than one fifth were powered by gasoline – the remainder being steam-powered. So what the hell happened to the electric car? we hear you ask. It’s a valid question, for how can we have landed on the Moon in the intervening century or so that has elapsed since electric cars first become popular, and yet not have fully mastered this comparatively basic technology? And speaking of the Moon, the first manned vehicle to drive on its surface was ironically an electric vehicle, the Lunar Rover, which was originally used in 1971 during the Apollo 15 mission. Conventional wisdom says battery life and vehicle speeds are the problems that prevent electric cars being more widely sold. Conversely, many independent investigators have suggested electric cars were, and continue to be, quashed by bigger entities for monetary reasons. If the electric car is another example of suppressed technology then oil corporations are the obvious culprits. After all, oil companies are known to purchase nearly all patents on proven efficient battery technology. Many argue this is to guarantee motor vehicle owners remain dependent on oil. Besides the oil industry, other potential collaborators in this conspiracy include the US Government and its military – both of whom are commonly acknowledged to have major interests in the oil business. It’s conceivable they could have conspired to kill off electric cars or any other technology that avoids continued dependency on gasoline. Even more so when you consider war is big business and oil fuels – both figuratively and literally – many a war. This would probably hold true for the governments and military regimes of Britain, Russia and many other nations. The conspiracy theory of bigger players crushing electric car inventions gained mainstream awareness in 2006 with the theatrical release of Sony’s documentary film Who Killed the Electric Car? It was notably produced by Hollywood producer/screenwriter Dean Devlin, who has a history of making conspiracy-themed films such as Independence Day, Universal Soldier and Stargate. Interviewees and apparent believers in the film’s explicit suppression theory included Martin Sheen, Mel Gibson and Ralph Nader. Who Killed the Electric Car? chronicles the release and eventual destruction of General Motors’ EV1, a battery electric vehicle that was tested on the market in the mid-1990’s. The film rather convincingly argues that the oil industry, in collusion with automobile manufacturers and the US government, prevented the mass public from being given a chance to purchase the EV1. 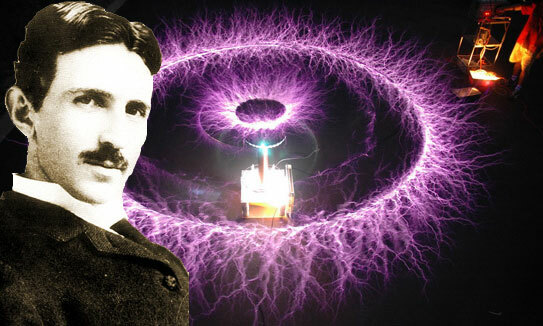 Nikola Tesla claimed to have invented a highly efficient electric motor that contained rotating magnetic fields. Like most of Tesla’s more radical inventions, his version of an electric car was never made available to the public. However, his discovery of the rotating magnetic field was eventually utilized for various modern electromechanical technologies such as generators and induction motors. Twenty-first Century Silicon Valley start-up Tesla Motors is one of the more innovative companies producing electric cars. 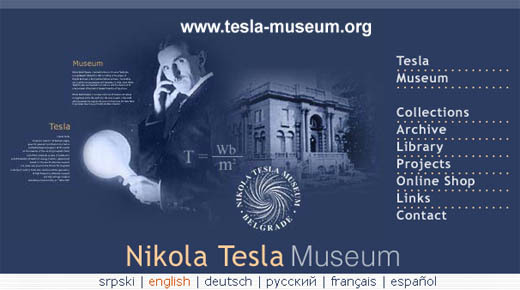 Their name, as you may have guessed, highlights the ongoing influence of Nikola Tesla’s works. One of the latest model Tesla cars, the Model S, is equipped with a 300-mile range battery pack, potentially silencing the argument once and for all that electric vehicles have limited range due to battery life. 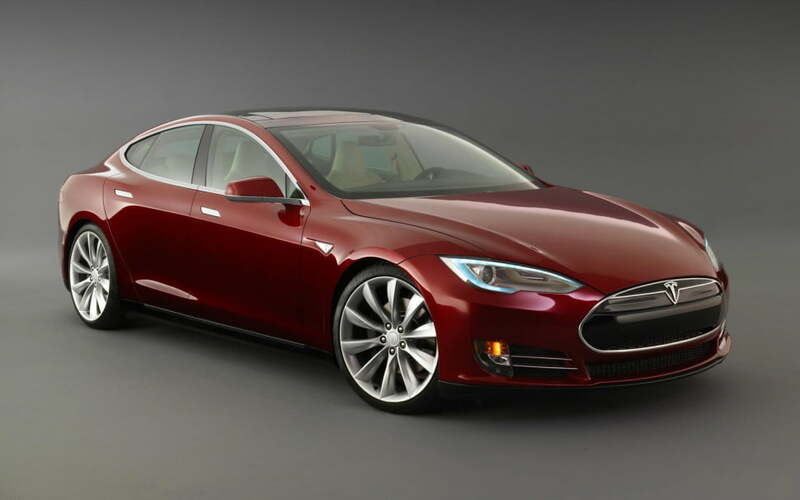 The Tesla Model S electric car gets thumbs up from motoring critics. Although manufacturing very fast and reliable vehicles, Tesla Motors tends to produce premium vehicles with higher purchase prices than the average gasoline-run car. Unfortunately, this discounts much of the mainstream public from buying them, although the company is certainly worth keeping an eye on. With expected economies of scale, the prices of Tesla Motors’ vehicles are likely to become more affordable in time. If they don’t, be warned that will give rise to yet another conspiracy theory! So, after roughly 180 years of this technology, the electric car surprisingly remains a niche automobile on the road today. However, in the last few years there has at least been a global resurgence of interest in electric cars. This revival has been primarily fueled (excuse our pun) by a few forward-thinking governments, celebrities and environmental organizations – not to mention customer demand. Filmmaker Chris Paine, who directed Who Killed the Electric Car?, released a new documentary entitled Revenge of the Electric Car. This updated story of one of the most environmentally friendly vehicle technologies appropriately premiered on Earth Day, April 22, 2011 at the Tribeca Film Festival in New York City. On January 5, 2014, National Geographic ran an article on its daily news website reporting that the world’s first fully electric Formula racing championship series will soon be launched.The event, known as the FIA Formula E Championship, will take place in 10 cities including Berlin, Miami, Beijing, Monte Carlo, Los Angeles and Rio de Janeiro. Virgin Group founder and long-time environmentalist Sir Richard Branson, as well as electric car enthusiast and film star Leonardo DiCaprio are among a host of big names who have already been announced as taking part in the event. Could the world finally be ready to embrace the electric car and make it the dominant vehicle on the planet? Near the Arctic Circle, 200 miles north-east of Alaska’s capital Anchorage, exists the site for the High Frequency Active Auroral Research Program – better known by its acronym, HAARP. This controversial ionospheric research program, which officially speaking is not an intelligence or military program, has been shrouded in mystery since its inception. Little wonder HAARP has been the subject of ongoing heated debate in both mainstream and alternative media outlets. Managed by the Air Force Research Laboratory and the Office of Naval Research, the program also receives scientific input from renowned academic learning institutions such as Stanford, MIT and UCLA.According to the US Government, HAARP is nothing but a field of antennae in remote Alaska constructed to improve telephone communications and monitor the ionosphere. Supposedly it’s just a little research project, yet it has cost American taxpayers over a quarter of a billion dollars and counting. But hey, who’s counting? The fact that HAARP is being so heavily sponsored by the likes of the US Department of Defense, the Defense Advanced Research Projects Agency (DARPA), and the US Navy and Air Force, does not seem to reflect the Pentagon’s line that it’s a research program and nothing more. And why are many of America’s top scientists and engineers also involved? Critics of HAARP include Native Americans, Alaskan residents and neighboring Canadians, environmentalists, a small, but vocal group of scientists and engineers, and naturally, conspiracy buffs. The latter theorize HAARP is everything from a weather manipulation device to a broadcaster of mind-control frequencies to a weapon of mass destruction capable of creating hurricanes, earthquakes and tsunamis. Nobody seems to know for sure. What else is new in this book? Is there any truth behind all the wild theories surrounding HAARP? To find out, you probably need to consider the past – and as we previously warned, all roads in the world of suppressed science lead back to Nikola Tesla. The Alaskan site certainly has shades of Tesla’s early 20th Century Wardenclyffe facility in New York State. And that’s not where the connections to the Electric Magician end. Many say HAARP is a continuation of Tesla’s technologies and discoveries. After all, HAARP’s official purpose is to study the ionosphere, and nobody studied the ionosphere more than Tesla did. As mentioned earlier, Tesla’s Death Ray invention was referenced in a weapon patent taken out by Dr. Bernard Eastlund (1938-2007). The Texan physicist took out three US patents many believe were used to construct HAARP. Even though the US Government denies any connection, numerous researchers concur that the Texan physicist’s designs were nearly identical to the Alaskan facility. In particular US Patent #4,686,605. In this patent, Eastlund describes a weapon that could alter the ionosphere, transmit electromagnetic radiation, modify the weather, knock out power grids, bring down airplanes and eavesdrop on, or destroy, communications of foreign enemies. In what may be the smoking gun, the US patent for Eastlund’s invention is now owned by ARCO Power Technologies Inc., which is a sub-company of ARCO-Atlantic Richfield, a defense company hired by the Pentagon to build HAARP. Admittedly, that’s all circumstantial evidence and it could be entirely coincidental. Then again, HAARP has almost as many coincidences flying around it as does the theory that Oswald alone killed JFK, which by the way does anyone still actually believe? 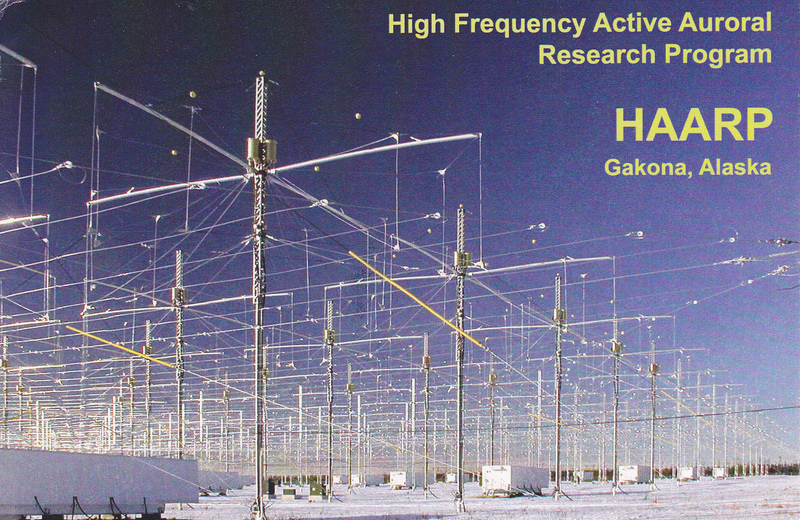 Either HAARP naturally attracts controversy, or there’s a monumental cover-up going on as to the true nature of this ‘ionospheric research program’. Weather manipulation accusations dog HAARP. Manipulating the weather sounds a bit far out, doesn’t it? But consider that weather modification technologies were officially banned by the United Nations in the 1970’s. For the UN to go to that trouble four decades ago, you could reasonably assume the concept of inflicting category five hurricanes or famines on enemies by altering the weather was close to becoming a scientific possibility. Or, who knows, maybe such technologies already secretly existed. An intriguing 1996 US Air Force paper titled Weather as a Force Mutliplier: Owning the Weather in 2025 detailed the military’s attempts to turn the weather into a weapon by learning how to control it. Another document, delivered at the 1997 Intersociety Energy Conversion Engineering Conference, stated that “The effects of HAARP on the weather are completely unknown”. It went on to make the point that “heating the jet stream over Alaska could have profound results on the weather in Denver or Miami”. A year later, in 1998, the European Parliament’s Committee on Foreign Relations, Security and Defence Policy demanded an independent tribunal investigate the “legal, ecological and ethical implications” of the “global concern” that is HAARP. The US didn’t play ball and no such investigation ever eventuated. According to some, HAARP can cause blackouts of entire regions. The technology was believed to be responsible for the extensive power cuts that hit US states and Canadian provinces in August 2003, leaving around 50 million people without power in major cities including New York, Toronto, Ottawa and Detroit. Adding substance to this theory is the University of Tokyo’s recording of a HAARP test-firing only 11 minutes before the blackout occurred. If theorists are to be believed, HAARP’s bad karma gets worse. A lot worse. Theories abound surrounding HAARP’s possible responsibility for Hurricane Katrina’s assault on New Orleans in 2005. On one conspiracy theory website, abovetopsecret.com, there was a chart illustrating extreme and supposedly unnatural fluctuations in the Earth’s atmosphere during the days of August 24 and 25, which was precisely when Katrina was forming. Above Top Secret forum members claimed such fluctuations could only be caused by HAARP. Other disasters that theorists have blamed on HAARP include the 2004 Indian Ocean Tsunami, the Haiti earthquake in 2010 and the Pakistan floods of the same year, the 2011 Japanese earthquake and tsunami, and the ensuing Fukushima nuclear disaster, as well as Typhoon Yolanda in the Philippines in 2013. Fukushima nuclear disaster just one of many disasters blamed on HAARP. If HAARP is behind any of these catastrophes then the aforementioned Splinter Civilization has a massive amount of blood on its hands. The combined death toll of all these events is in the millions and many, many more were left injured or homeless. Counting against this mega conspiracy theory, however, is the fact that HAARP is relatively transparent. Its program is unclassified, documents relating to its environmental impact are in the public domain and it has an open day for the general public twice a year. Hell, you can even call the facility at Gakona, Alaska, and what’s more somebody will answer your call! In case you’ve gotten a sudden case of HAARPitis, here’s their phone number: (907) 822 5497. Whatever the case, one thing’s for sure: HAARP ain’t the little high school science experiment the US Government would have the world believe it is. “Nikola Tesla is proof that real greatness surpasses national borders and differences.” –US President George W. Bush in a message to then President of Croatia, Stjepan Mesić. As quoted in “Nikola Tesla’s anniversary and ancestry” in The New Generation on December 24, 2006. Assuming it is true that certain scientific breakthroughs are kept from the masses by some kind of Splinter Civilization, it’s our belief that nothing is more important than releasing details of these inventions. If used for good works, such technologies would have the potential to eradicate poverty in Third World nations and increase living standards throughout the rest of the world. The Tesla Memorial Society of New Work’s website is worth a visit. Tesla’s inventions and ideas in particular should be declassified so that the scientific community can study his work in its entirety – something it has never been able to do. This step may be a necessary one if our society is ever to evolve beyond scarcity and corporatocracy, and move toward total sustainability. But, hey, we ain’t scientists, so you probably shouldn’t be listening to us. All the technologies we wrote about in our trilogy may have been based on nothing other than fabrications by mad inventors. For all we know, the inventors mentioned in this chapter may have been nothing more than disgruntled scientists, frustrated that they could never quite nail their inventions. So maybe it’s best you keep on assuming that latest-model smart phone or tablet you’re holding really is ‘cutting edge’ technology.